Evidence that stratospheric circulation changes drive ocean changes, and thus climate changes | Watts Up With That? From the University of Utah and the “science is not settled” department comes this interesting bit of research. The simplified artist’s conception shows how changes in polar vortex winds high in the stratosphere can influence the North Atlantic to cause changes in the global conveyor belt of ocean circulation. Credit: Thomas Reichler, University of Utah. SALT LAKE CITY, Sept. 23, 2012 – A University of Utah study suggests something amazing: Periodic changes in winds 15 to 30 miles high in the stratosphere influence the seas by striking a vulnerable “Achilles heel” in the North Atlantic and changing mile-deep ocean circulation patterns, which in turn affect Earth’s climate. — “Stratospheric sudden warming” events occur when temperatures rise and 80-mph “polar vortex” winds encircling the Artic suddenly weaken or even change direction. These winds extend from 15 miles elevation in the stratosphere up beyond the top of the stratosphere at 30 miles. The changes last for up to 60 days, allowing time for their effects to propagate down through the atmosphere to the ocean. The stratosphere is connected to tropospheric weather and climate. In particular, extreme stratospheric circulation events are known to exert a dynamical feedback on the troposphere1. However, it is unclear whether the state of the stratosphere also affects the ocean and its circulation. 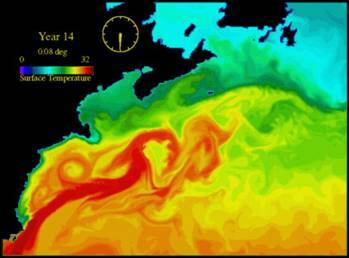 A co-variability of decadal stratospheric flow variations and conditions in the North Atlantic Ocean has been suggested, but such findings are based on short simulations with only one climate model2. Here we assess ocean reanalysis data and find that, over the previous 30 years, the stratosphere and the Atlantic thermohaline circulation experienced low-frequency variations that were similar to each other. Using climate models, we demonstrate that this similarity is consistent with the hypothesis that variations in the sequence of stratospheric circulation anomalies, combined with the persistence of individual anomalies, significantly affect the North Atlantic Ocean. Our analyses identify a previously unknown source for decadal climate variability and suggest that simulations of deep layers of the atmosphere and the ocean are needed for realistic predictions of climate. Shown are composite anomalies averaged from day 0 to 60 following the strong vortex events of Fig. 2. Sea-level pressure anomalies are contoured at ±0.5, ±1, ±2, ±3, ±4 hPa; red and blue lines indicate positive and negative values, respectively. I would think that more physical measurements, not more computer simulations, would be the basis for reducing uncertainties. But hey, I’m just an engineer. But overall, it sounds heretical, or ho hum; no direct support for AGW here. Move on, please. If the study had finished with a sentence suggesting that added GHG were a catalyst for these sudden stratospheric wind events, then this might gain some traction in mainstream climate science. Very interesting, tho’ I note the care taken to disassociate from any possble undermining of global warming meme, and the reliance on models to prove the connection. While agreeing with the general premise, there is some outstanding questions. 1. The study does not show any reasonable link between the vortex and affect on the Atlantic current? 2. The vortex can be influenced by low solar output, particularly UV which influences ozone distribution that can favor planetary waves traveling to the arctic vortex. Did they miss this bit? Sorry, not impressed at all.Intuition or gut feeling, they have this totally reversed. By priming the models, they force the result they see. Again no physical observations, just models. added to which radiation warms the ocean not relatively slightly warmer air. The experts can nail. Looks to me as complete nonsense. The bulk of the incoming heat is absorbed by the oceans, not the stratosphere. The mass in the stratosphere is tiny compared to the water masses of the currents redistribution the heat over the planet. It’s like saying that you can heat a pan of water more efficiently by heating the air above it than by heating it’s bottom. Sounds like the new study has cause and effect backwards. How do they determine that it is the Stratosphere that drives the oceans, not vice versa? “Seems to correspond with” doesn’t sound very convincing. Q: By what mechanism does CO2 cause the change in atmosphere & therefore what is the forcing factor used in the puter model? Q: Hasn’t the conveyor belt theory already been thrown into chaos by not behaving as predicted, in a previous post either here or at Climate Realist? I think the general findings seem reasonable, but why have they been linked to good old fashioned AGW & CO2? So.. there “might” be a correlation…. even if it might be the wrong way around. This is yet another way that La Niña is not the opposite of El Niño. While Stratospheric Sudden Warming events were not discussed in my new book, they could be added to a list differing impacts of La Niña and El Niño. It is an attempt to support AGW theory by getting around the ‘problem’ that the oceans control air temperatures and that CO2 warming of the air has little or no effect on the temperature of the ocean bulk.Their earlier ocean skin theory seems not to be sustainable. Instead they suggest that somehow the stratosphere affects ocean temperatures by another route. In that, they are getting close to my earlier propositions whereby changes in the temperature of the stratosphere (especially involving the polar vortices) can alter tropospheric climate zone positioning and thereby change global cloudiness and albedo to alter solar input to the oceans which would then affect ocean temperatures and circulation. As usual it is then back to the issue of causation. I propose that solar variations in the mix of wavelengths and particles (not TSI) naturally alter the ozone balance differentially at different heights to alter the vertical temperature profle of the atmosphere and thus the air ciculation patterns in the troposphere. That is the main influence on cloudiness and albedo changes. I have accepted that more CO2 in the air would have a similar effect on the air circulation but miniscule as compared to the solar effect combined with internal ocean cycles. At least they have now figured out that a warmer stratosphere weakens the polar vortices and makes the jets more meridional. Interestingly AGW theory previously said that human CO2 emissions were cooling the stratosphere thereby intensifying the polar vortices and leading to more zonal jets. Now that the jets are more meridional despite still increasing CO2 they are here suggesting that somehow humans are warming the stratosphere over the poles. I think the truth is that an active sun cools the stratosphere naturally causing more intense polar vortices which contract and pull the jets and climate zones poleard allowing more solar energy into the oceans. That extra solar energy into the oceans skews ENSO in favour of warmer El Ninos and that is what affects ocean circulations. The opposite when the sun is quiet. Could somebody please tell me why the immense Great Southern Ocean and the South Pacific Oceans and all of the Southern Hemisphere apparently has no influence on the global climate nor it seems has any connection with the global atmosphere and climate? The one eyed concentration by most Northern Hemisphere based so called climate researchers on Northern Hemisphere phenomena and then claiming that those same Northern Hemisphere phenomena are the cause of all the changes in the Earth’s climate are a striking example of scientific ignorance and stupidity when the immense mass and heat content of the Great Southern Ocean and the Southern Pacific Ocean are looked at even by a layman. The heat energy content of the global atmosphere is matched by the heart energy in the top 3.2 metres of the world’s oceans. From this figure alone it would seem that the Oceans, most of which global Oceans are concentrated in the Southern Hemisphere and what happens via the medium of the Oceans are the true influences and controllers of the global climate. Take one of those globes of the world on it’s stand. Place the globe stand high enough so that the bottom of the globe is a little above eye level and Antarctica is pointing directly at you. Rotate the globe until you have the entire Southern Pacific Ocean and the large part of the Southern Ocean facing directly at you. Step back a couple of paces and take a look. When the globe is rotated to the right position you will see Antarctica and New Zealand in their entirety and these will be the only complete land large masses you will see. You will also see just the edge bit of eastern Australia and the west coast of South America and that’s it for major land masses in that sector of the planet. And what you see is almost totally ignored by narrow tunnel visioned northern hemisphere based climate researchers who seem incapable of even considering that there may be other very major influences in other remote parts at world at work on the global climate other than those that that exist just outside of their own back door. Isn’t the mind an amazing place to have an adventure. This looks backasswards to me. Given the huge disparity in heat capacities and the very small surface-area-to-volume ratio, it seems highly improbable that a small change in air temp could have much effect on the massive water column. Maybe I should try running a bath of cold water and letting the warm room air heat it up for me??!! They have the tail wagging the dog as usual, do they have no common sense? is known what happpend to Jo Nova’s account ? It seems everything is about your book theses days. Because its from the Potsdam Institute. !! Since when has a correlation between two processes implied that one is the cause? Yes, – elsewhere, I have argued for several years now that the North Atlantic is a very important key area to the seasonal weather of the northern mid-latitude land masses – winter cold and summer warmth: and now explained probably, by the mechanism of the Hadley Cell, seemingly affected and re-orientating and connected to ozone distribution influenced by the changing UV output of the sun and whether the direction of the jet stream as it approaches Europe, is mostly from the south west or north west, (being essentially NW when the sun is inactive and SW when the sun is active). The jet stream NW vector results in a tendency for earlier snow cover in autumn and later snow melt in spring in northern Eurasia, with resultant regional cooling. My question is whether there is any/much agreement that the new research about ocean current, climate changes and stratospheric circulation changes, could indeed correlate and connect with the UV/ozone distribution research and “favor planetary waves travelling to the arctic vortex”, and which would perhaps be the reason for the multi-decadal but not exclusive variations between northern hemispheric meridional/zonal circulation patterns? Put another way, the Azores high at times of low sun activity, stands as a big rock just to the south of the polar vortex jet stream and causes ripples by way of planetary waves that have influences to northern hemisphere weather that are not just regionally European. As one who spent two years investigating all available data relating to the north Atlantic and managed to reproduce the Atlantic Multidecadal Oscillation, more accurately then Gray and Mann I can with a degree of confidence claim that they got this upside down. Events that happen well below the ocean surface are one of the two key elements that change the North Hemisphere temperature. The other is the sun of course, but not the TSI, there is not much of it up there for 6 months of the year. What about the Mann claim? Some more research is probably warranted and it would be interesting to see if there was any comparable phenomenon at the South Pole. However, I’d be leaving the supercomputer at home and looking for empirical evidence. Also, I think I can detect a faint smell of dinosaur farts. What should immediately jump out from this, to any competent scientist, is that the “climate changes” discussed here are not global (of course) but regional. The Earth will shed its heat to space, via radiation, just as fast, no matter the details of circulation over the sphere. But consensus climate science does not even begin to know how the atmosphere is heated (it is by direct absorption of incident solar radiation, not by heat from the warmed surface). And it is not a matter of a “slightly warmer” atmosphere warming the ocean either (at least not on Earth); atmosphere and surface are independently warmed by incident solar radiation, and the vertical temperature lapse rate allows excess heat from the surface to slide right through the atmosphere vertically — while driving the winds laterally — without further warming it globally. My Venus/Earth temperatures comparison directly suggests that regional, and global, circulation — whether from uneven surface heating or “stratospheric events” (does the name invest them with physical reality, or real effect?) — only controls the weather; it doesn’t control the global mean temperature. But the times are not right for scientists to seriously contemplate a revolution in their fundamental thinking, I know. Dogma — also known as “settled science” — is king for now. But that means everyone (including me) has a lot to learn, but particularly those miseducated in consensus climate and atmospheric science. We are only at the beginning… as always. The study’s computer simulations show a decadal on-off pattern of correlated changes in the polar vortex, atmospheric pressure oscillations over the North Atlantic and changes in sea circulation more than one mile beneath the waves. Mass of the oceans water column 1 cm2 cross-section and 1 mile deep is about 125 kg. Thermal energy ratio contained in the two columns is in range of thousands. Energy, energy and energy is what is required to move the ocean. There is a tiny tail wagging a large dog. Let me get this straight. By increasing levels of a trace-gas, present only in parts per million (CO2), we can redirect the polar vortex…. However, the Sun, which chucks out gazillions of charged particles that all converge on the polar regions, has no effect on the polar vortex at all. Believe that, and you will believe anything. A better research project, would to be to study any possible links between the solar cycle and the polar vortex cycle. Just have a model gang-bang to MAKE UP simulated offspring that “reduce uncertainties”? Ah, the master strikes again — the master of the wiggly graphs with no explanations and no idea whatsoever as to what is going on. Do you have a pet spider who creates these graphs for you, or is there any scientific logic behind them? First, it was the down-welling IR causing global warming. Now it is changes in stratosphere (caused by CO2), which changes ocean circulation, which causes warming. At the end, the warming was not global but caused by us altering the sweet spot in the North Atlantic. The mechanism is interesting and possible, but the outcome of the study is pure BULL[snip . . site policy . . mod]. The link between stratospheric circuation and ocean changes is an interesting one. It is fairly clear the AMO can explain a lot of climate variability. What is not clear is whether it is a pulse, an index of some other driver, or a heart, actually driving climate. It’s almost as if they added CO2 and Ozone to the paper afterwards. Looks like another degree thesis… Don’t know if it is, but I would like to see thesis research being outed as such in both press releases and published papers. I have a much lower level of confidence in new thesis work than that from etablished researchers in the field, and that’s not saying much at all. One seemingly overlooked benefit to modeling, is it may lead to consideration of previously unconsidered mechanisms by virtue of the output generated, but thats not to say the output gnerated is even close to reality…. I would suspect the same underlying cause for a shift in atmosphere and ocean, or the former may drive the later. Like temperature, how does the atmosphere drive the ocean with three orders of magnitude difference in mass, when both are no more than an oil slick on a puddle compared to the mass of the planet that they rest on. Now all we need to 4000 years of observational data to confirm that their 4000 years of modeled data are sound. I don’t trust climate science anymore and it’s not my job to read every new piece of utter crap they call science, I’ve read enough, The whole field is a laughing stock around the world, the involvement of government funding for favorable data may be despicable, but to base environmental and energy policy on it and therefor milk the human population like cows is a scandal. When did humans become a just bunch of farm animals to politicians and those elitist types. Very generous of you to call me a master of anything; funny that in a distant past an august institution did attach the ‘magister scientiae’ to my otherwise unpronounceable name. You shouldn’t disparage work of the nature’s tiny wizard of weave, by comparing its amazing constructions to the esoteric scribbles of a mere mortal. I’ve seen no empirical evidence that solar modulation of terrestrial spatiotemporal pattern gives a 1:1 mapping to global total cloud. Perhaps explore a more diverse set of cloud metrics if clouds are your interest. Just want to inform that Jo Nova is up again on a temporary site (use normal URL and you’ll be redirected). She says a full transfer of the usual site (with all posts and comments) is underway. I have never heard of skeptics doing technical attacks on warmist sites. But the reverse seems to happen over and over again. That’s how much they care about a free debate. BTW, thanks for the excuse to include a link on this thread. You can’t say enough about the influence of ocean currents on climate….and how the warm currents melt the polar ice which increases absorption of sunlight 12 times which increases melting of ice which increases absorption of sunlight which increases melting which increases absorption of sunlight…..(positive feedback loop) The fact that any polar ice is returning at all is a statement that the warmists are wrong. That polar ice is exceeding averages shows they are very wrong. I’m surprised that I haven’t seen anyone make this point. It is this issue which demonstrated to me how biased the science and media are. As I started seriously looking into the climate issue, I saw a BBC Newscast in Jan-Feb 2005 in which they spent 5 minutes describing the above positive feedback loop. “Finally” I said to myself, “somebody is being honest and not saying it is due to CO2”. But the BBC concluded the newscast by concluding that we therefore need to step up our efforts to curb CO2 to save the arctic. The BBC report was apparently based on the Cambride Arctic report of Nov 2004 which was similarly biased. For years the EDF had arctic reports on their website which if anybody read them said that Arctic warming was due to currents and positive feedback not due to CO2. It is important to dispell the arctic lies as melting of the ice is one area where warming is visible and make good TV press. Unfortunately the skeptics haven’t done this. For those dissing the model, I’d say this is a good example for where the model is useful, but in a different way. The real problem with the paper is that they immediately state that CAGW can cause this and lead (to what else?) catastrophe. First the model is important because we can see relationships. This then leads to OBSERVATION. Do we see it in the real world? Then we can look at hypothesis, and test them. It seems from the timing that the sun is the obvious suspect. CO2 is steadily increasing, yet these scientists see a decadal oscillation. Either it is a natural oscillation (perhaps ENSO), or it’s the sun. Well then, what causes what? If the stratosphere heats up, well then, what causes that? What about the affects of cosmic rays on cloud formation? How does that enter into all of this? Oh, that’s right; if you don’t know or you cannot model it, you simply ignore it. The ONLY other “science” that relies on computer simulations and statistical analyses to “prove” this or that is, ………drum roll please…………..ECONOMICS. Both these pseudo-religious fields use computer models that, A PRIORI must assume that certain variables (known, or unknown, or more perhaps, they know these variable are there, but they simply do not know if/how/why they affect the analyses , so they simply ignore them) are irrelevant to the study, and voila, you get your answers. Any field of study in which controlled experiments are not possible, is not a science; it is a game of political football. It might seem that way, but it saves Bob a lot of time if people read his book, rather than him over and over having to spend an hour writing a synopsis of his careful observations. Anyway, even when he spends an hour writing a comment here, it still is merely a synopsis, and likely will leave out some detail, and people who scutinize comments on this site tend to be sharp, and to pounce if you leave out a detail. So then he has to counter the comment. People who can’t spend the time to read his book likely won’t have the time to read his longer comments, anyway. Anyway, give the guy a break. Interesting that I noticed a gigantic upper-air swirl over east Canada just the last couple days — the N American polar vortex. Pretty far south for only late Sept. Hope not to see that in mid Jan! It is probably one of those “what-came-first,-chicken-or-egg” situations where the ocean effects the atmosphere as the atmosphere effects the ocean. Your powers of observation have to be highly tuned to catch onto which influence is “ruling,” at any given moment. As unlikely as it sounds, the very thin air miles up does “seem” to effect the weather and currents down below. However it may only be a indicator, rather than what is actually changing the jet stream and storm tracks and ocean currents. It is very fascinating stuff, and well worth observing. It is even useful, if it gives you a week or two warning of an impending arctic outbreak. Think of the money you save, if your pipes don’t freeze, because you got a job that you were procrastinating from finishing done, all because some forecaster went nuts about some cold wave ten days in the future. Solar variation in the UV part of the spectrum is much greater as a percentage than solar variation in total irradiance. And UV couples non-linearly to the stratosphere through the creation of the the greenhouse gas Ozone. The described mechanism is more likely an explanation of solar coupling to the climate than another anthropogenic coupling to the climate. Somebody in the CO2 club asked these researchers to provide an anthropogenic link to how CO2 can affect Arctic melt. We know why the melt occurs. Favorable oceanic and atmospheric teleconnections between the AMO/NAO, the polor vortex and its AO, and incoming oceanic currents. Their challange was to connect all this to an anthropogenic agent of change. What they got was correlation without mechanism. Again. Kinda like connecting all that to non-TSI “stuff” from the Sun. Both are ill-conceived and more like a single hair on the end of the elephant’s tail, wagging the entire herd of elephants. Well “melting of the ice” wouldn’t appear to be caused by atmospheric temperature. With Danish Meteorological Institute records going back to 1958 Daily Mean Temperatures have remained very consistant during the arctic melt season. The first thing I thought of from the headline was the “Toilet Bowl” at the Kalihari in Wisconsin Dells, the small amount of water circulating counterclockwise in the bowl then falling from the bowl into the 9 foot deep pool below imparts a wicked counterclockwise whirlpool current in the pool. Can’t help yourself it seems. I re posted your links so you’ll get a little more exposure. “What they got was correlation without mechanism. Again. Kinda like connecting all that to non-TSI “stuff” from the Sun. Both are ill-conceived”. I think there is a sound mechanism involving all that non-TSI stuff. Changes in the mix of solar wavelengths and particles appear to affect the ozone balance differentially at different heights of the atmosphere and ozone amounts control the strength and height of the temperature inversion at the tropopause. It is the presence of ozone that causes that temperature inversion thereby creating the stratosphere in the first place. To get circulation shifts in the troposphere all one needs to do is warm or cool the stratosphere by altering the ozone balance. If that stratospheric warming or cooling occurs differentially at equator and poles then the changes can alter the gradient of tropopause height between equator and poles so that the jets and climate zones can shift latitudinally resulting in cloudiness and albedo changes. Cloudiness and albedo changes alter the amount of solar shortwave entering the oceans and that is what makes the difference. Well said. Also; Rotate it just a little more and you will have a face full of ocean. Not withstanding a few island groups ( wink, wink) scattered about. Yep an Achilles heel alright. Ill translate – watch my eyebrows – If you are uncertain about observation, you know measurements of the circulation of the ocean basins say 50 years ago – make it up. Hasn’t the climate system always been the same? Hasn’t it? I am getting sick of scientific papers that are merely reporting the observation of a heretofore unremarked correlation and they concludes that the coincidence “suggests” an earth shaking conclusion that is nowhere in evidence. It’s especially egregious when they don’t even bother to propose a physical mechnism as the “suggestion’s” basis. Okay, Utah guys, so you found coincidental similarities in oscillation patterns between two layers, separated by a third layer? How can the one act on the other, through the third? Won’t you at least take a guess? Are you sure it’s not just a temporary and coincidental occurrence that will go away in a year or a decade? If so, why? If not, are you sure the it’s not the ocean acting to guide the behavior of the stratisphere? Is that possiblity ignored because it deflates CAGW and the CO2 problem? And why would anyone’s first guess be that the layer with the least mass and lowest energy density is CAUSING shifts in the layer with hugely higher mass and energy density? That would seem highly unlikely to me, on it’s face. And if all this energy is passing throught the troposphere, wouldn’t that be observable in the troposphere in a similarly systematic way? Or, if it is unaffected, please explain how the troposphere could remain largely unaffected and still allow some transitory force from above on the oceanic convective processes in the North Atlantic?. And your use of a big blue down arrow suggesting a force that you haven’t named on the chart is highly insulting. Explain this force, or remove your silly arrow or at least make the arrow point both ways, showing how little you actually know. They don’t have data, so they used models to make up data. Which is to say, they don’t have any data at all, because the output of a computer model isn’t data. Back in Jan 26 – Feb 3, 2012, WUWT Decimals of Precision – Trenberth’s Missing Heat (Willis Eschenbach), part of the comment thread went into how variable was the temperature of the oceans in (x, y, z, time of year, time of day, time in oceanic cycle) and Nyquist sampling issues. 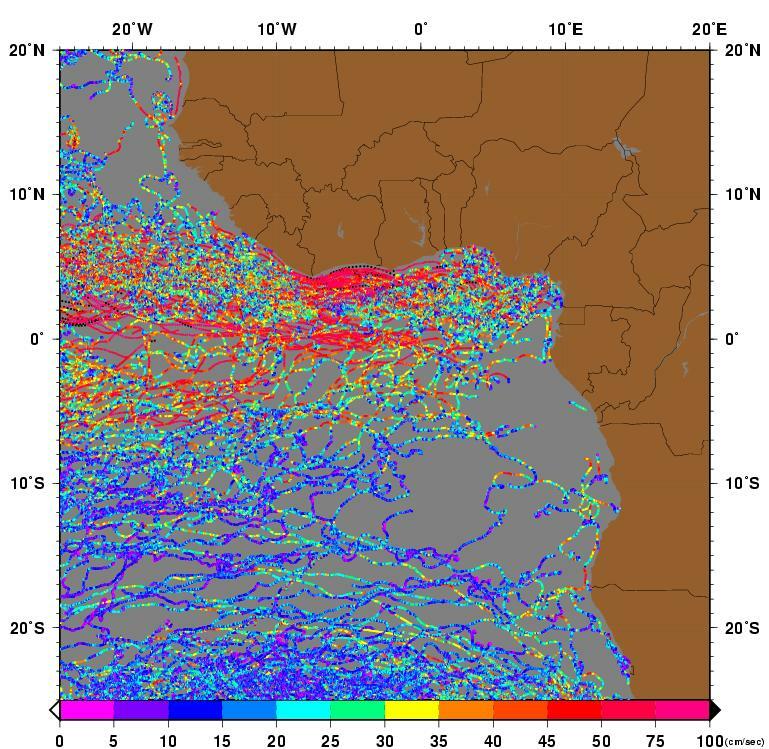 At the end of that thread, I found a slide illustrating of how complex ocean currents can be: Interannual atmospheric variability forced by the deep equatorial Atlantic Ocean, Figure 2. Brandt-2011, Nature 473,497–500(26 May 2011). These data were collected at only one small part of the ocean: 0 N, 23 W, from 0 to 3500 m water depth, 2006-Jul to 2008-Mar. The slide shows East-West component of current velocity in color, depth in Y, time in x. What is striking is high variability in velocity as a function of depth. At the surface the current is >20 cm/sec eastward. At 200 m, the current reverses to ~ 10 cm/sec westward. There might be another reversal at 500 m. A gap in data collection. At 1100 m it is weakly westward, at 1200-1400 m it is eastward at ~10 cm/sec. By 1700 m it has reversed to westward again. A 30 cm/sec difference is more than 0.5 knots. This is only one location of data, only one projected velocity direction, only one study. You have to ask, “if the vertical profile is this complicated here, on the Equator, what does the rest of the ocean look like?” A “conveyor belt” as a conceptual analog belies the underlying complexity. Sure, and in just a few more decades of direct observation, they’ll actually have the required data. Maybe five or ten. As it is now, they have three or four. * Some three or four ENSO maxima, which are weakly synchronous with the solar cycle but chaotic/erratic. * One oscillation of the PDO (which recently reversed for the first time in the entire cycle and which appears to be tightly coupled to and modulated by ENSO. * We have yet to see a change in phase of the NAO, which appears to be chaotic, not periodic, and is weakly coupled to the Arctic Oscillation (AO). The NAO has been in “warm phase” since the mid-70’s, with the 1980-2000 stretch the longest and strongest warm phase cycle visible in the entire record post 1870. It has been mostly neutral for a decade, but with a burst of warming arguably visible around 2007-2008. * The AO is similarly chaotic with no clear periodicity, and had its strongest positive (US/Europe/Arctic warming) behavior in the entire record in the 1990-2000, was strongly positive in 2007-2009, and isn’t yet registered for 2012 (but I’m betting it’s been strongly positive). * The Antarctic Oscillation (AAO) is for all intents and purposes unknown. The instrumental record only extends back to 1957 for Antarctica period, and even satellite observations have not (AFAICT) produced a credible picture of the long term/decadal timescale behavior of the AAO. The little that is known suggest that it is tightly coupled to both the PDO and the NAO, and that the relative phases of the latter two cycles create warming or cooling on the Pacific or Atlantic facing shores of Antarctica. What goes on inland seems ill documented even by satellites as far as identifying some dominant circulation pattern and its variation. The article above seems to link stratospheric changes in the AO to macro-scale changes in the global thermohaline circulation, but this is still only a tiny piece in the huge, coupled, system of atmospheric motions that redistribute tropical heat received via insolation en route to outer space. Heat redistribution is net warming globally because of the in radiative loss rates — heat transport that cools the tropics and warms the poles net warms the system (even more so by modulating ice-pack albedo) while trapping the heat in the tropics causes them to heat a bit but then re-establish dynamic balance while the poles — and the planet — substantially cools. As Richard Lindzen (MIT physicist) and I independently have pointed out, weather “extremes” are created by the strong temperature differentials of hotter tropics and cooler poles, not the more uniform but warmer temperatures we have recently experienced. If anything, we are in a historic low for violent Atlantic hurricanes to support this assertion. One of several reasons I am a “skeptic” about CAGW is that the Earth is an enormous set of more or less distinct, but coupled, fluid dynamics systems (described by the Navier-Stokes equations). The NS equations are the most fiendish and difficult equations the human race has ever studied and tried to solve, and the set of coupled, chaotic equations that give rise to climate on a spinning, tilted, mostly oceanic planet in a complicated set of orbital resonances with the highly variable Sun and outlying gas giants with drifting continents covered with high mountains and bare deserts as well as rapidly varying vegetation, a strong geomagnetic coupling that affects atmospheric composition and chemistry, and with a significant part of its radiative thermal balance being modulated by set of coupled reservoirs of greenhouse gases and albedo modulations is a hellish implementation of the NS PDEs. This isn’t just “any old” nonlinear system — it is so nonlinear that 100% of the variability observed in the climate could easily be totally natural, while on the other hand every time I sneeze today (an “anthropogenic” cause of variation) I completely change the weather, and quite possibly the climate, a decade from now. Separating signal from noise, globally meaningful cause from the “random, chaotic” consequence of strongly coupled aperiodic oscillators, is IMO quite impossible, certainly impossible without — as you say — more data! Data that we cannot just reach out and get. Data that we must wait patiently to accumulate, with modern instrumentation, over decades. In a century we might understand the weather well enough to make a stab at the climate. By then we might have observed some of the major oscillations change phase. We might have figured out what is happening over Antarctica, what is going on in the deep oceans. We might have worked out the puzzles in the CO_2 cycle, figured out how much ozone matters (and where, and why). We might have a clue or two about solar state and how its magnetic state affects — or doesn’t affect — weather and climate. In the meantime, climate models are attempting the near-impossible — to simulate the entire system in the absence of direct observational data describing the actual coupling of all of these moving parts across a period of time where they did things like change phase, or the current study above that — only now, in 2012 — discovers a yet another strong correlation between the decadal oscillations and climate variations, not just weather. Until we understand the decadal oscillations and can figure out why the NAO sometimes spends 20-30 years in a state with a consistent cooling effect for the arctic itself and the southeast US and Europe, then spends 30 odd years in a state with a strong and somewhat cumulative warming effect, and why the warming cycle appears to be at least coincident with what might be a comparative solar maximum, and how it in turn is affected by ENSO and the PDO and the AO and the AAO (and vice versa) and how modulation of cloud cover feeds back either warming or cooling (depending on where and how high the clouds are) and… — until we understand nearly everything, we really don’t understand enough to make confident predictions of anthropogenic disaster, not when the NAO could change phase and confound our predictions almost overnight — or not, we just don’t know. And it will take decades of accumulation of modern-era data with modern instrumentation to find out. Am I misunderstanding something fundamental here, how do they separate solar influence on both the atmosphere and the oceans. Would a simple explanation be differences in lag times given the nature and volumes of the two media? Having trouble with this since, the oceans with 1000x heat capacity of air would be the primary source region for energy in the system, which in then could have an effect on the entire system. would think that the stratosphere would be a lagged reaction to events from sources with much greater energy. In addition, the wild card of particular matter from volcanoes and also solar effects seem to make the stratosphere the driven, not the driver, and the observations that apparently “lead” the weather below may simply be the result of a prolonged series of events outside the stratosphere, which naturally would be ready to turn another way as per cyclical climate theory. My take is the stratosphere is the driven, not the driver, and it reacts to the influences on it. Its almost like saying arctic ice melt will drive the climate, when its other factors that forced the melt in the first place. In other words in the search for the unknown mover, the stratosphere is not it. Superb comment, RGB!! It deserves to be a post/article, if nothing else so the rest of us can simply acknowledge and applaud. It does encapsulate some of my own doubts and questions, when I see lots of people claiming more confidence and knowledge in these vast climate matters than seems to be warranted. So the fight and funding should be over how we are measuring the system, not attempting to understand it yet. Exactly. The more I attempt to comprehend Thermohaline Circulation the more baffled and amazed I become. There are a lot of charts which simply don’t add up, and seasonal pulses which are not even considered. Stupid Question: So, why average 18 models into one? Researcher: Well, no single model confrmed our results. Stupid Question: So all 18 models taken one at a time falsify your results? Researcher: Well, no, by averaging 18 models their errors cancel each other out so we get a more accurate result. Stupid Question: Don’t errors have the potential to add to each other rather than cancel each other out? Researcher: Well, uhm, this is climate science, and uhm…. Stupid Question: OK forget the errors. There are 22 models in the IPCC ensemble. How come you used just 18 of them? Researcher: Well, uhm, that was the combination of models that confirmed our results. Stupid Question: OK, so ALL OTHER combinations of models falsify your results? Researcher: Well, uhm, let me explain PCA and tree rings to you. We have this technique that was developed where we sample 345 trees, throw away the data from all except 12 of them, weight the data so that the one tree that confirms our results is 50% of the data, produce a weighted average, and show this as a proof of global warming. This is the exact same technique except we’re using a sub set of model data instead of a sub set of tree ring data. Its all very complicated which is why only us climate scientists understand it. Stupid Question: Do you actually believe your own bullsh*t? Researcher: Well, if you’ll unhook this lie detector, I’ll answer that question…. And junk science enters the building! The ozone hole is not ours. The claimed chemistry that showed that we caused it to grow larger was bogus. It is caused by solar radiation interacting with nitrogen molecules which form NO and react with ozone. And, of course, we are not significantly or even detectably increasing CO2 in the atmosphere, let alone the stratosphere. It’s all in the attribution and due diligence is lacking here. What I love is the apparent lack of understanding of the oceanic conveyor belt. 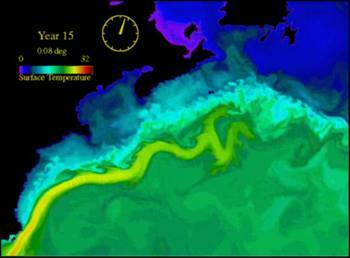 The Gulf Stream flows faster during warm periods and slows during cold times. This makes sense as the viscosity of water varies with temperature. They refer to a signal between the stratosphere and the surface. What would that be? There is simply not enough energy content in the thin stratosphere, that could travel from up there to the surface, to have an effect on the ocean. It is much more likely that the ocean changes alter and affect the stratosphere. Thermodynamics really needs to be considered here. A fine summary of the curent situation. However, I have already proposed a broad conceptual overview that appears to link all those diverse phenomena in a narrative that appears (for the moment at least) to fit observations and basic physics. I am moderately confident that my narrative is correct. I am another engineer, usually avoid reading long posts, yours are exception, always red with interest, always a new aspect to a topic. You say : We have yet to see a change in phase of the NAO, which appears to be chaotic, not periodic, and is weakly coupled to the Arctic Oscillation (AO). Trying to explain it eloquently is not my forte, but I may get to it some ‘rainy day’, when all the AGW storm blows over and scientists really get interested in the natural variability. Your colleague Scafetta had a go, unfortunately he totally misunderstood where 60sh (more like 64-65) year cycle comes from, and ended in bit of a muddle. Have no intention of following his path, not at least as yet. They are apparently claiming that they are able to trace causality in their model from the stratosphere to the troposphere to ocean circulation, but causality in their model is not causality in the real world. Do they really not know what a fact is? If they can really get a model based on physical principles to generate the causality they claim then that is interesting in itself. Why fake it up by claiming that their model result is a fact about the real world? Oh, if only it were that simple! The ocean ‘conveyor’ is a heat transport system and its speed and the temperature of the volume of water moving which dictate where and how much energy gets distributed around. Simplistically, a warm fast current tends to produce turbulent eddies at its boundary with cooler ocean water and this mixing reduces the temperature of the current and slows it down. On the other hand a cooler, slower current tends to have a smoother laminar flow and retain the energy for longer. Varying levels of turbulence tend to have a balancing effect on how much energy is transported. Add in variations to wind speed, salinity, tides e.t.c. and you have a highly non-linear system to deal with. We do not yet have either the data or mathematical methodology to be able to quantify the energy moved by this messy this spatio-temporal system. Computer models are therefore useless in helping us to understand how ocean currents effect weather/climate. No wonder they always get it wrong. Finally we have a demonstration of a previously mythical phenomenon; best described as the Monster Truck Tractor Push. All red necks are familiar with the Monster Truck tractor pull, were a heavily loaded tractor is pulled by a monster truck, until it stalls out as the tractor slowly digs its blade into the earth. So in this newly observed phenomenon, the tractor is pushed through a rope, instead of pulled. A high degree of driving skill is required to keep the rope straight so it doesn’t bend and fold up. Long conjectured, it would appear that someone has finally succeeded in doing it. By the way, what is the torsional stiffness of the lower Troposphere, through which the stratospheric twists must be stransferred to the deep ocean waters to spin them ?? A seemingly almost afterthought claim “its the CO2 and Ozone stupid” unsupported by any data or science it would appear. Exactly HOW does Ozone or CO2 have an effect on the polar vortex? And how do they prove what direction their correlation goes? Correlation does not equal causation..
Last if I remember correctly a warmer stratosphere means a cooler troposphere. She’s back aladin – at least a temporary site already on. Clearly the stratosphere cannot drive the oceans directly for the reasons eloquently stated by many here. But if changes in the stratosphere alter cloudiness and the amount of energy entering the oceans then it can drive the oceans indirectly. However, the stratospheric temperatures can only be changed significantly by the sun from above. The oceans make little difference to stratospheric temperatures but they can make a difference to the tropopause height when the rate of energy release changes during the course of internal ocean cycles. It is the sun that produces changes in both stratosphere and oceans. Since there is common causation it is not surprising that there are correlations. In theory CO2 is supposed to have caused the cooling stratosphere of the late 20th century by holding more energy for longer in the troposphere That idea has been falsified by a cessation of stratospheric cooling whilst CO2 continues to rise. Could it work like one of these? Ozone amounts dictate temperatures in the vertical column of the atmosphere above the tropopause because ozone molecules react strongly to incoming solar energy. That is why there is a temperature inversion in the stratosphere. If ozone amounts fall above the poles when the sun is more active then the stratosphere cools and the tropopause rises so that the polar vortex becomes more intense vertically but less extensive horizontally giving a more ‘positive’ AO and AAO with more poleward / zonal jets. CO2 was supposed to have been the cause of more poleward / zonal jets in the late 20th century but now we can see that it was not. CFCs were supposed to have been a contributory factor cooling the stratosphere by reducing ozone amounts but recent findings are casting doubt on that proposition because the ozone response to changes in solar activity levels are the reverse of what was expected above 45km. 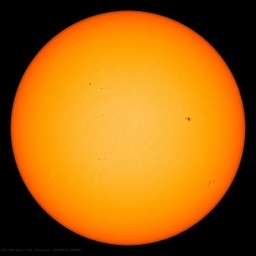 So most likely solar activity levels control ozone amounts and stratospheric temperatures. Maybe neither CO2 nor CFCs were ever responsible. Quite so. I have previously contended that the troposphere and thermosphere warm when the stratosphere and mesosphere cool (at a time of active sun) and vice versa. Solar variations being the cause in both scenarios. Neat pictures of summer and winter Gulf Stream. The problem is that it could be quite different the following summer and following winter. Meandering is a process involving Chaos and Strange Attractors, and defies prediction once you get a ways downstream. Watch a trickle of water running down the side of an old porcelain sink, (that beads the water up, so the trickle meanders over the surface,) and you’ll see quite a variety of movements. Occationally the trickle is nearly straight, while at other times it can move surprisingly far to the left or right. The same sort of factors determine where the Gulf Stream’s warmth will wind up, and whether it will head straight north or wind all over the place and only get north in a very blended state. It is very interesting (as the Gulf Stream has no banks) but cannot be predicted. @ E M Smith…I really enjoy your posts. They are usually on topic and insightful. Isn’t that backwards? Theories, model runs and even wild speculation that are “consistent with” with the real world are not proved true but at least they’re not proved false. The above statement implies that the real world might really be real because it is “consistent with” the model. LOL. Have we no shame gentlemen? It’s news to me! I’ve never heard of the stratosphere whacking down hard on the troposphere. Or is Reichler just another who has forgotten the verb “affect”? The melting of polar sea ice only increases the absorption of sunlight by a factor of two. The albedo of sea ice is in the range 0.5 to 0.7, whereas in regions with a solar zenith angle of 80° ice-free ocean albedo ranges from 0.2 to 0.35. I do not know very much about atmospherics but my idea of why we had stratopheric warming warming a few years ago in the arctic was this ,the jet stream was blocked from flowing across the Atlantic towards Europe so that it had to flow through the arctic to reach Europe and therefore was colder when it reached Europe.My reason why the air fow would be cooler is that warmer air has to rise above colder air and could lead to stratospheric warming because of the stratification of temperatures . The water upwelling off California as a result of the PDO phase change is about 1500 years old. The proximate cause of the increased anticyclonicTrade Winds that cause this upwelling seems to be a persistent red positive anomaly in stratospheric pressure. http://www.cpc.ncep.noaa.gov/products/intraseasonal/z200anim.gif12000. Well, they have demonstrated conclusively that changes in the “stratosphere” and in the “ocean”, that is, a bunch of numbers in a computer simulation and another bunch of them, are related. Unfortunately it never establishes a causal relationship between the two vectors, because these changes are in fact driven by electricity running in the computer’s circuits on one hand and the software uploaded to it on the other one. It may certainly tell us something about that piece of computer code (all several million lines of it), but why would these results be of interest to anyone but designers, coders and users of that software? So, before this study could be taken seriously, researchers are facing a rather formidable task: to demonstrate beyond reasonable doubt that their “stratosphere” and “ocean” behaves the same way as the actual Stratosphere and Ocean do, that is, the vectors constructed from measured data correspond (in a well defined way) to those produced by gaming software. However, playing the game 4000 times over can never add even a bit of information to this correspondence, therefore there is no way uncertainties about the observations could be reduced by this trick. It does not bode well either, that their understanding of MOC (Meridional Overturning Circulation) seems to be lacking. No, that’s not exactly what “researchers knew”. The first thing to consider is that ocean circulation is not a heat engine. That is, it is not driven by differences in water density, but the entire system is kept in motion by (low entropy) mechanical energy input, supplied by tidal breaking and winds (mostly over the southern ocean). The only way heat from the surface can penetrate into the deep ocean is by turbulent mixing, which works against density gradients. This is the process that makes room for more dense, cold, salty water in the abyss, making any downwelling whatsoever possible. Otherwise the deep reservoir of this stuff would simply fill up completely and the overturning would stop altogether. Or, rather, it would slow down to a crawl, as some heat would still be supplied by geothermal processes at the bottom, but that flux is an order of magnitude or two smaller than the one required to run it properly. Now, density of seawater, unlike that of fresh water, is highest just before freezing. On freezing it gets even higher by a process called brine exclusion, that is, ice crystals do not like salt, therefore water left over on freezing becomes even more salty. Such water masses will always be available somewhere at the edge of sea ice, as long as there remains sea ice at all. But there is no way for it to disappear completely with the current configuration of continents, not even under the wildest “scenarios”. And temperature of these water masses are not determined by “climate”, but by the very physics of water, that is, by its freezing point. So. There always will be water ready to “downwell”. But it can only do so if another process, deep turbulent mixing (driven by mechanical energy input) makes room for it down below. Therefore the global flux of downwelling is quite independent of “global temperature” or such. The next question is, of course, where this downwelling should occur? The answer is, obviously, at those points where salinity is the highest right around the ice edge. And that can indeed vary, with huge consequences to regional (not “global”) climate around such points. In other words, if more water sinks around Antarctica, less can do so in the Northern Atlantic (seesaw, anyone?). Except if deep turbulent mixing is increased by either higher tidal breaking (which depends on the relative positions of sun and moon, that is, on the Metonic cycle) or if the Roaring Forties, Furious Fifties and Shrieking Sixties happen to increase in strength down south, inducing stronger internal waves in the water body that break at rugged bottom features. But there are hard limits to wind speed, so it can’t possibly increase forever. And Dennis, you obviously have no clue how to spell George E. Smith. But as a matter of fact I do indeed know exactly how the sled works in the truck/tractor pull; it’s just in the heat of the moment, my short term memory couldn’t recall the word sled, so I punted with the blade instead. But I have to say that a monster truck/tractor pull, is my kind of entertainment; on a par with WWF wrestling, as a totally decadent fun recreation. Seriously- this looked interesting right up until the 4000 years of computer simulation gibberish and it got worse from there. There may well be a real phenomena worth studying, but the testable hypothesis has to be established before creating a clusterf1*k of a model to claim they’ve proved anything. Test and measure, test and measure…where do these people learn how to do science. Sorry, another engineer that is tired of this non-sense . More relevant is the effects of winds on sea currents and surface water movements, depending on the condition of the AO and NAO, which when negative result in higher sea surface temperatures in the North Atlantic, with the region just below Greenland showing particular sensitivity. A negative NAO in summer correlates well with increased Arctic summer ice loss. So true. IMHO, it’s Drake Passage that makes all the difference. Southern circumpolar current whacks into it and sends a cold shiver up the spine of South America, then out into the central Pacific. That’s the driver of the rest. Wilson showed that Length Of Day changes in correlation with solar cycle. That means “things slop then”, so what gets shoved at the Strait changes… it can only take so much. Also, IMHO, the “driver” of that process is the lunar orbital mechanics. (i.e. tidal changes). That it is driven by the same planetary motions that change solar output gives the ‘correlation’ between solar cycles and weather (climate) cycles. We propose that such abrupt millennial changes, seen in ice and sedimentary core records, were produced in part by well characterized, almost periodic variations in the strength of the global oceanic tide-raising forces caused by resonances in the periodic motions of the earth and moon. A well defined 1,800-year tidal cycle is associated with gradually shifting lunar declination from one episode of maximum tidal forcing on the centennial time-scale to the next. An amplitude modulation of this cycle occurs with an average period of about 5,000 years, associated with gradually shifting separation-intervals between perihelion and syzygy at maxima of the 1,800-year cycle. We propose that strong tidal forcing causes cooling at the sea surface by increasing vertical mixing in the oceans. On the millennial time-scale, this tidal hypothesis is supported by findings, from sedimentary records of ice-rafting debris, that ocean waters cooled close to the times predicted for strong tidal forcing. So we’ve got a bunch of things that “all change together when they change” from solar output to UV levels to rotation rate (LOD) to tides to… and all driven by the planetary positions and orbital resonance locking it all together. Wiggle matching can not sort out which does how much nor ascribe proportional causality. We can share it Cuzz, specially since we both know how Monster Truck/Tractor pulls work, besides, we Smiths have to stick together.